Guillermo del Toro’s Pacific Rim came out this weekend and made $38.3 million here in the US ($91 million worldwide). It’s the biggest del Toro flick to date, but the film also cost $190 million, so it will need to show some legs to make a profit theatrically. It does seem like it’s in good shape to make a profit eventually, though, which is good for two reasons del Toro’s career and the prospect of actually seeing more original genre films get made, not just sequels and comic book adaptations. It unlikely to spawn a sequel, though. Which is fine. More importantly, I thought the movie was really fun. The dialogue was cliché-ridden, the characters were relatively thin, and most of the actors are pretty wooden. A notable exception is the girl who plays young Mako (Rinko Kikuchi’s character) in some flashback scenes; that little girl was gifted. Spoilers are okay in the comments section here, so if you haven’t seen Pacific Rim yet, you have been warned! 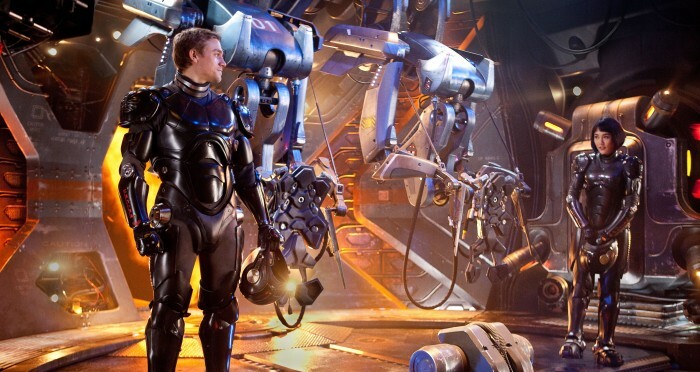 A new trailer for Guillermo del Toro’s Pacific Rim is online, and it continues to look epic. This one gives us a little more of the human side of the story — and also a bunch of new mecha-on-kaiju action. The film stars Charlie Hunnam, Idris Elba, Rinko Kikuchi, Ron Perlman, and Charlie Day. It opens on July 12th. If this trailer doesn’t get you more excited about Pacific Rim, I’m revoking your geek card.